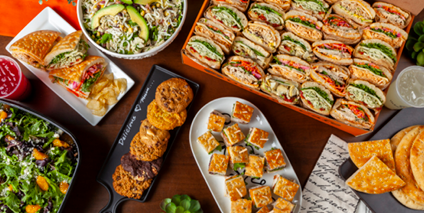 An assortment of Urbane’s Classic 16 half sandwiches which includes the following: 2 So Cal, 1 Pesto Sundried Tomato, 2 Southwest Chicken, 2 Club, 1 Vegetarian Californian and served with our popular Cilantro Chicken Specialty Salad, 10 cookies, 10 chips and 10 sodas. Assortment of Urbane's Classic sandwiches straight from the hearth (16 half sandwiches). Platter includes the following 2 So Cal, 2 Southwest Chicken, 1 Pesto & Sundried Tomato, 2 Club and 1 Vegetarian Californian. Assortment of Urbane's Foodie Favorite sandwiches straight from the hearth (16 half sandwiches). Platter includes the following 2 Cilantro Chicken Torta, 2 Moroccan, 1 Turkey Cranberry Brie, 1 Chimichurri, 1 Tuscan Vegetarian and 1 UC Banh Mi Chicken. Assortment of Urbane’s Classic sandwiches straight from the hearth. 24 half sandwiches. Platter includes the follow: 2 Pesto & Sundried Tomato, 3 So Cal, 3 Southwest Chicken, 2 Club and 2 Vegetarian Californian. Assortment of Urbane's Foodie Favorite sandwiches straight from the hearth (24 half sandwiches). Platter includes the following 3 Cilantro Chicken Torta, 3 Moroccan, 2 Turkey Cranberry Brie, 2 Tuscan Vegetarian, 1 Chimichurri and 1 UC Banh Mi Chicken. 24 Urbane Kids-Sized sandwiches which include Grilled Cheese, Turkey Sandwich, PB&J and The Ben. Assortment of 24 Urbane Kid-Sized Sandwiches that include the Grilled Cheese, Turkey Sandwich, PB&J and The Ben. It is served with 10 Chocolate Chip cookies, 10 chips and 10 fruit cups.